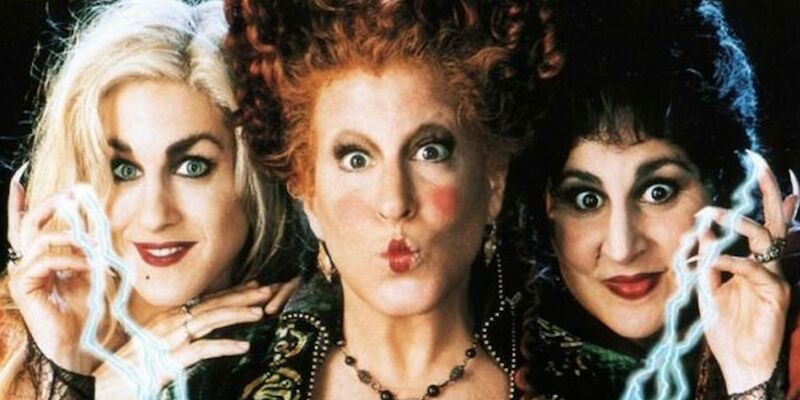 Believe it or not, Halloween is only a few short weeks away. Though you can't go wrong with some classic Trick-or-Treating, we also wanted to share some other spooktacular Austin events that are sure to be a BOOtiful experience for the whole family. Okay, we're done with the bad puns now. Maybe. Pumpkins, corn mazes, scarecrow stuffing, face paintings, train rides.... It's fall fun galore at Sweet Berry Farms, y'all! Admission is free but each activity has its own small fee. Pumpkin patch with fun activities like pumpkin painting, hayground and hay rides! Hours are 9 am 6 pm on Fridays and Saturdays and Sundays from 10-5. Storytime in the patch is10:30- am to 11:15 on Fridays! The Metz Halloween Carnival at the Metz Recreation Center boasts a costume contest, door prizes, music and so much more. For the brave kiddos (and grown ups!) the haunted house is just $1! Offering three different trails including one for younger kids, spook lights, storytellers, pumpkins and more. Tickets are $15 at the gate or $14 if purchased in advance. Oct. 13, 14, 20, 21, 27 & 28 at 7 p.m.
Get ready for a night of trick or treating, costume contests, bounce houses and even a family talent show! Oct. 21 @ 3 p.m.
Come out for the fun of the 23rd Annal Spookyfest that includes a trick-or-treat scavenger hunt, live music, a costume contest, arts and crafts, a haunted house and so much more! This is a free event but it is suggested to bring two non-perishable food items or $2 per person for the Round Rock Serving Center. October 21 from 8 a.m.-6 p.m.
From face painting to straw art to pumpkin carving, everyone is sure to have a blast at the Last Straw Fest! Don't miss out on the live DJ from 12-4! Date + Address Oct. 29 @ 10 a.m..
Ready for a dance party, broom races, a photo booth, pumpkin smashing, costume contest, and food truck courtyard?! Then don't miss out on this ultimate movie in the park night! We can't forget to mention that this is a BYOB event! Hayrides and costume contests and a Trick-or-Treat Village, oh my! Admission is free but activities do come with a small fee. Don't miss out on FREE movie in the park featuring Casper at 6:45. This festival is sure to delight kids and grown-ups alike! Oct. 26 @ 5:30 p.m.
Come for the candy and giveaways, stay for the animals! This trunk-or-treats spotlights animal adoptions and allows families to take advantage of the $20 adoptions going on through the end of October at the Pflugerville Animal Shelter! October 28 from 11 a.m.-3 p.m.
Treaty Oak is known for being a distillery and for making some of the tastiest cocktails around.Â Whether you're wanting gin, rum, vodka or bourbon, they've got it. And pitchers of the stuff, if your heart so desires. Pitchers of cocktails! (No pitchers of bourmon though. Because, uh, bad decisions would be made.) 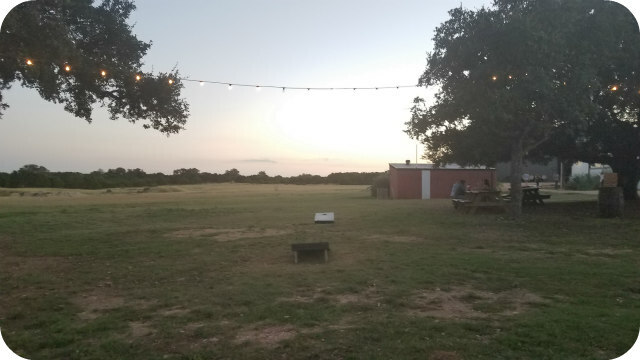 As if that doesn't already sound enough like paradise, Treaty Oak rests on 20+ acres of gorgeous land in the Texas Hill Country. With benches and games and twinkle lights galore and even a playground for the littles, this is one of the most magical places to spend an afternoon in the greater Austin area. But, wait. I haven't even made my way to the most exciting part yet. 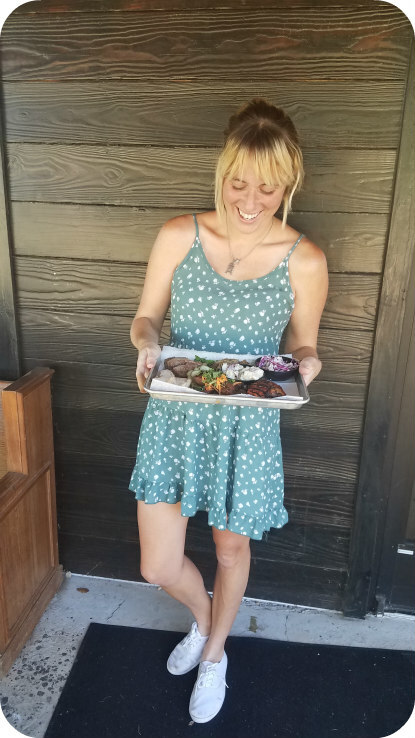 Treaty Oak has recently started serving culinary delights at their new restaurant, Ghost Hill. 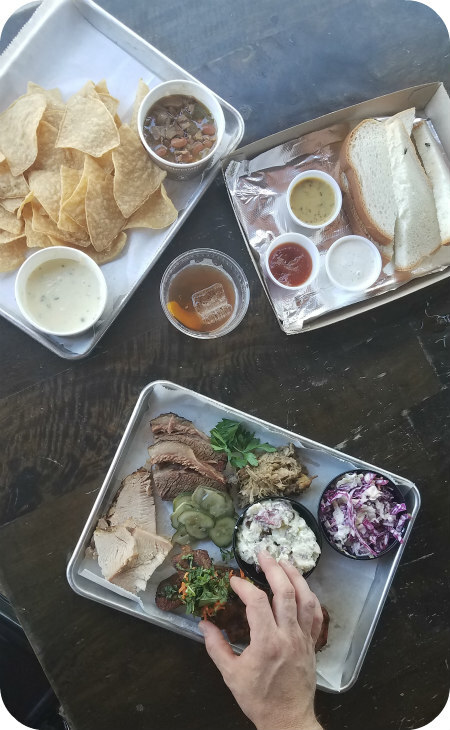 While Treaty Oak has always served tasty snacks, they now offer a chef-prepared BBQ menu that is absolutely divine. Executive Chef Chris Andrews is something of a culinary genius with the combinations and flavors he has created in the dishes at Ghost Hill. The ribs were some of the best ribs I have ever had the chance to devour. Ever so lightly fried and with a sesame bourbon glaze, pickled carrots, Asian herbs,Â and lime. I might be trying not to drool while typing this. I might also be failing. Truth be told,Â barbeque is usually my least favorite type of food. This basically makes me a terrible Texan, I know, but there's the truth. BUT Treaty Oak had me second-guessing my standpoint on BBQ.Â Partly because the meats were all so perfect. The brisket, for example. Smoked to perfection and equal parts juicy and tender, this stuff quickly had me becoming a barbeque believer. And the roasted pork shoulder? Y'all. We're talking achiote, cilantro, onion, cotija, lime and corn tortillas to pile all of this goodness onto. Obviously, this visit quickly had me converting into a BBQ believer. But another major factor in my newfound love were the sides. Chris and I both agreed that many popular BBQ places do great with the meats but slack on the sides. The sides are usually my favorite part about BBQ, so I am thrilled to report that they are most definitely not skimped on at Ghost Hill. The potato salad was amongst my favorite of things to devour. It's both mayonnaise and mustard based, and this combo of flavors paired with the smoked brisket and lightly fried ribs left me swooning hard. But what equally impressed me in regards to each side was the care that was so obviously put into each. Chef Andrews knows that a meal is made extra special when every little detail is taken care of.Â So, to my delight, every side dish could stand alone as its own delicious meal. Even the queso, though not exactly a typical bbq appetizer, was divine. I've mentioned before that I tend to judge a place based on how good their queso is.Â To be fair, I wouldn't have judged the queso quite as harshly at a barbeque joint, but Ghost Hill got so many extra brownie points (cheese points) for their creamy, cheesy goodness. I can't write a post about a distillery without giving a shoutout to at least a couple of drinks, I have to recommend the Dark & Stormy, which is Treaty Oak's take on the Moscow Mule. Instead of vodka, they use rum! I absolutely love this substitution and now want to forever drink my ginger beer with rum. Not on their everyday menu is the seasonal spiked apple cider, which comes complete with an in-house made apple chip. Just the right amount of sweet and spice and everything nice. It was like drinking a cup of fall. Oh, wait, wait, wait. How have I not mentioned the ice cream yet? Because, y'all. Homemade ice cream. I tried the strawberry basil and was absolutely blown away by the way the basil so elegantly complemented the strawberry. Chef noted that he has always loved adding herbs to ice cream flavors, and this is definitely a skill he has mastered. If you're looking for sweets with a little aromatic kick, look no further than Ghost Hill. 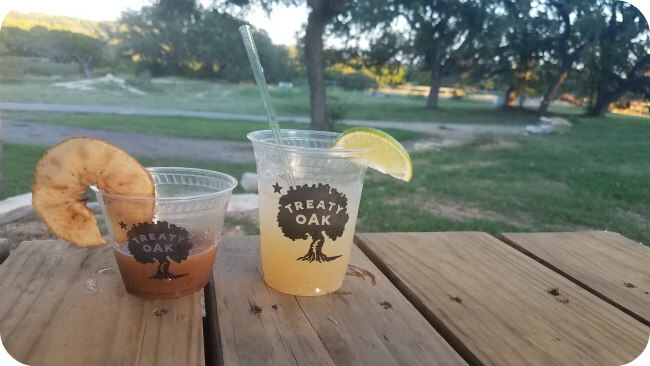 Treaty Oak is always working to make their space the best it can be, and it shows with every sip, every bite and every glance around their property. They've also recently expanded their hours to open not just on weekends but on Thursdays from 4-9. May I suggest visiting on one of these Thursdays? I may or may not have the inside scoop that the most unique of recipes are always being cooked up on this particular day. But, truly, whatever you day you decide to visit, you're going to feel like a kid in a candy store. Or an adult in a distillery store, if you will. I could rave for another fifty paragraphs or so about the happiness I found at Treaty Oak. Whether it be the gorgeous property or the exquisite tastes, the good company or the bounty of libations, this spot has been added to my list of treasures. So I'm sending out an open invitation for allÂ reading this. Come for the BBQ. Or if you're one of my vegetarian pals, come for the sides. Stay for the views and the pitchers of cocktails. And second helpings of barbeque. Come out for one of the largest Halloween events in Central Texas! $9 gets you carnival games, inflatables, rides, climbing walls, and free Halloween candy. Carnival games, prizes, candy, a costume contest and train and hay rides. Farmer Fred sure knows how to throw a party! This annual event includes everything from pony rides to arts and craft vendors to live demonstrations of jousting, archery and fencing. There is truly something for everyone at this fun fall fest! Free admission to create glow in the dark art, explore the science of skeletons with interactive bone exhibits and use your own bones to dance the night away! This Cedar Park train ride takes you to the quaint town of Bettram to pick a pumpkin from the Depot Pumpkin Patch. Includes a chat with Farmer Brown, a tour of the historic train depot and apple cider. This train ride is 3.5 hours with a 30 minute layover, but the memories made are sure to last a lifetime! Hosted by the Leander Police Department and featuring a variety of cars, including police cars and fire trucks to grab candy from. Games, a costume contest, raffles and more will also be included in the fun. Guests are encouraged to bring a new, unwrapped toy to donate to Blue Santa. October 31 from 6:30-8:30 p.m.
BookPeople will be hosting a kid-friendly spooky puppet show and a costume parade around the store, complete with a free book for the kiddos! Perfect for littles seven and under! Trick or treat yoself this Halloween season! Okay, we're really done with the candy corny jokes now.